Over the flurry of leaks and rumors over the past couple of days, Samsung has been the news more than often. The company is expected to launch two new devices in the coming months, with the Samsung Galaxy Note 5 expected to come on August 12 according to rumors so far. A more lesser heard Samsung device, the Samsung Galaxy Tab S2 has also been in the news for quite a while, though it has been overshadowed by the Korean tech giant’s flagship smartphone and phablet rumors. 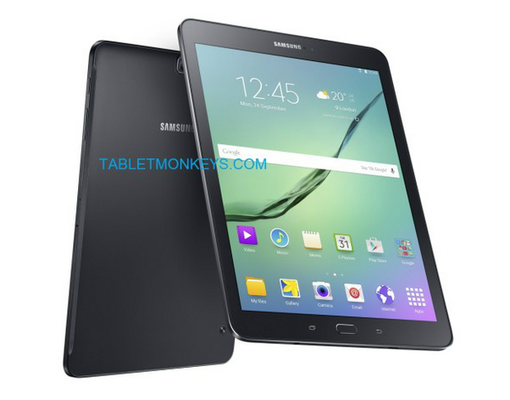 A press render of the Galaxy Tab S2 has popped up today however, and you can take a look at it in the image below. As can be seen in the image above, this year’s upgrade of the Galaxy Tab S will indeed be following the portrait orientation. The screen will now be in 4:3, falling in line with many existing tablets out there. Judging by these leaked images, we should also be expecting the Galaxy Tab lineup to be quite thin, which once again falls in line with what we’ve heard previously. The Galaxy Tab S2 rumors in fact started off from the fact that Samsung’s will be launching the world’s thinnest tablets this year, in a bid to outdo Apple and several others. The Galaxy Tab S2 8.0 and 9.7 inch variants are expected to come with a thickness of only 5.4 mm. This will be coupled with Samsung’s 14 nm Exynos 7420 Octa, also launched on the Galaxy S6 Duo this year. A 32 GB internal storage, coupled with micro SD expansion will also come on the device, with the Exynos being supplemented by 3 GB of RAM. For multimedia enthusiasts, the camera specifications on the duo are rumored to be rather modest, with an 8MP rear and 2.1 MP front camera. With an upcoming launch event in less than a month, will Samsung be launching the Galaxy Tab S2 upgrades alongside the Galaxy Note 5? Both devices will give users plenty of options when it comes to screen sizes and processor options and if successfully pulled off, will not only solidify Samsung’s market share in the gadget market, but also in the mobile hardware segment. The next couple of months are very important for the South Korean manufacturer indeed. Stay tuned and let us know what you think in the comments section below.